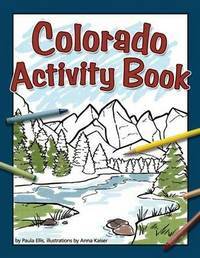 A New Way to Enjoy Colorado with Your Family How do you make the perfect Colorado getaway even better? Give your kids the Colorado Activity Book by Paula Ellis for hours of fun! Fascinating information about the region with maps to reference as you travel, mazes, word finds and pictures to color, it's a great way to learn about the area and is ideal for car rides and quiet time. Paula Ellis grew up in a small town in central Michigan. Her love of the outdoors and travel began at a young age. She is the mother of two children, daughter Heather and son Todd David. Through travel and everyday experiences, she taught them to appreciate, respect and enjoy all of creation. Paula enjoys being a grandma, exploring the wilderness, traveling and watching her four grandchildren grow and learn about the world in which they live. She believes children are eager to learn about their environment, whether they're playing in the backyard, traveling across the country or catching bugs on a camping trip. To that end, she strives to encourage children of all ages to see and explore all of the fascinating things around them.